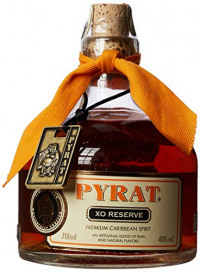 Pyrat XO Reserve is a select blend of fine, 15 year old Caribbean rums. It's smooth taste and delicious flavour is complimented by it's rich amber colour. Pyrat XO Reserve is excellent over ice with a twist of lemon or as an ingredient in a premium rum drink.